with another future Pentangle star, vocalist Jacqui McShee. 180g vinyl and artwork of the original UK edition. Printed inner sleeve with liner notes by British folk and blues revival expert Colin Harper." 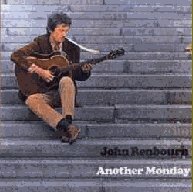 This is the follow-up as it were to 'John Renbourn,' the building site album -- the moonlight demo studio tapes having been taken by the little Transatlantic company, probably because they were going cheap. By now I had a new guitar, a gibson J-50 to be like Davey Graham, bought from an American airman for fifty pounds and replacing the trusty Scarth (only a fiver). I also had a contract and a change of clothes and naively expected recording conditions to improve. They did, but not to the extent of a fancy studio, more to Bill Leader's kitchen. In fact I could have done a lot worse. Bill had a recorded history of great stuff going back to pre-Topic days. He came within my realm of idolization by having recorded Ramblin' Jack Elliott on "Jack Takes the Floor." 'Lady Nothinge's Toye Puffe' had more of a mock-tudor feel in contrast to the mock-tutwiler folk blues. It wasn't a new thing for me but it became a direction. John studied with Tim Walker - this is a result. This is also called Woman Blues or I Know My Rider. A blues instrumental based on a kind of three-time rhythm. A railroad blues originally recorded by Blind Boy Fuller. Jacqui McShee sings on this one - the sleeve notes say that 'Jacqui is a young singer whom I first met at the Red Lion Club, Sutton, where she was resident'. Obviously Pentangle was still some way in the future. A piece for oboe and guitar with Jennifer de Montforte-Jones. An instumental from the repertoire of Davey Graham - so how come John gets the credit? John learned this from Mike Rogers, Jacqui McShee sings on this track.